The public NDEx site includes many networks that are marked as "PUBLIC" and are therefore accessible without signing in to a user account. Public networks can be found, viewed, and queried. This page provides details about searching networks as well as running neighborhood queries on a specific network. The easiest way to access high quality public networks in NDEx is through the Featured Networks button. The Search Examples button shows a few examples of possible searches. The Browse button lets you view all the public networks available in NDEx sorted by most recent. Search terms can be entered directly into the search bar: try running a search for "melanoma". You can also search for one or more genes of interest. When searching for genes or proteins, you can decide to enable the optional Search Term Expansion feature. More info about this feature is available further down in this manual. The network search results page displays all the hits and provides basic info about the networks, such as format, owner, last modification date etc. If you hover on a network name, a pop up window will display the network description. Only public networks are returned in a search; a private network will only appear in a search if you have been granted access to that network by its administrator or if you are the owner of that network. To inspect a network, click its name. The network page will open up: information about the network is displayed in the info panel on the right. You can scroll down to view all information in this section, including the network description, reference info and various network properties (if any are available). You can always switch to a tabular view using the Table button in the bottom right part of the page (red oval below). Once toggled, that same button allows you to go back to the graphic view. Starting from NDEx v1.3, a stand-alone Apache SOLR service is used to implement Lucene Indexing. Advanced search capabilities allow users to search (and query) networks using keywords or other network attributes. A complete list of the indexed attributes is available in the tables below. Note that some attributes below are highlighted in blue text. These are NDEx internal attributes and are not encoded in the CX networkAttributes aspect. In the case of attributes like ‘edgeCount', they are calculated values. You can search for networks using keywords: type "metabolism" in the search bar and hit enter. The system returns all networks that have the term "metabolism" in their name, description or associated to its nodes and/or edges. You can also use wildcards: if you type "met*" the system will return all networks that have metabolism, metabolic, methionine, metformin and the met gene referenced in their title, description, nodes or edges. In the screenshot below, the last network has the keyword "metabolic" in its description (red circle). However, if you tipe "name:met*", the system will only return networks that have those terms in their name: in the screenshot below, you can see that the network called Biosynthesis of Sterols is missing as the term "metabolic" is contained in its description. If you know the unique identifier (UUID) of a network, you can search NDEx using this information: type "uuid": in the search bar followed by the UUID of the network you are looking for. You can search networks specifying a range of values: type "nodeCount:[11 TO 79]" in the search bar and press enter. The system will return all the available networks that have between 11 and 79 nodes. You can search networks based on when they were created or last modified: type "creationTime:[2016-02-26T00:00:01Z TO 2016-02-27T23:59:59Z]" and press enter. The system will return all available networks that were created between 12:01 am on Feb 26, 2016 and 11:59 pm on Feb 27, 2016. Do not confuse creation time with last modification time (red circle below). You can search networks owned by a certain account. To do this, typea range of values: type owner: followed by the user account name. For example, try to search for owner:ndextutorials. The system will return all the available networks that are owned by the account "ndextutorials". Starting from NDEx 2.1, you can decide to perform Search Term Expansion on genes and proteins. This feature expands your search term(s) to all its possible synonims and runs a search using all of them. This makes sure that you will find all networks that have your genes/proteins of interest even if the genes/proteins of interest are listed using an uncommon synonim or an alternative identifier. Search Expansion is limited to human terms only. So, if you search for a yeast gene/protein, the search will be performed accordingly but no Term Expansion will occur. Performing a search for human genes/proteins with Term Expansion will return more results compared to the same search performed without Term Expansion. Please not that Search Term Expansion is not compatible with Lucene Syntax. For more information and details about Lucene Syntax, please refer to the Lucene Documentation. Type the query term(s) (for example: a gene name) in the query text box (red arrow). Select the type of query from the dropup menu (red oval); the 4 types of query are described in more detail below and web app embedded documentation is also available by clicking the blue info icon next to the Type dropup menu. 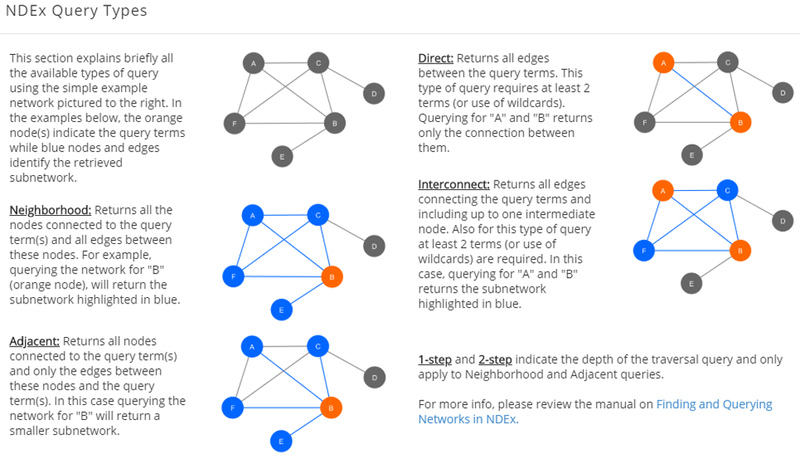 Neighborhood: returns all the nodes connected to the query term(s) and all edges between these nodes. Adjacent: Returns all nodes connected to the query term(s) and only the edges between these nodes and the query term(s). Direct: returns all edges between the query terms. This type of query requires at least 2 terms (or use of wildcards). Interconnect: returns all edges connecting the query terms and including up to one intermediate node. Also for this type of query, at least 2 terms (or use of wildcards) are required. The retrieved neighborhood pictured below is a small network specified by the "smad3" term, consisting of "21 nodes" and "75 edges". For large networks, users can decide to set the query result as display sample of their network and override the default, system-generated sample view. To do this, you must be logged in to your account and have either Admin or Edit permission on the network; then simply click the "Set Sample" button available in the query result page. Finally, users can decide to open their query result in Cytoscape to further annotate the network or run an analysis. If all requirements are satisfied, the "Open in Cytoscape" button will be colored and available to click.